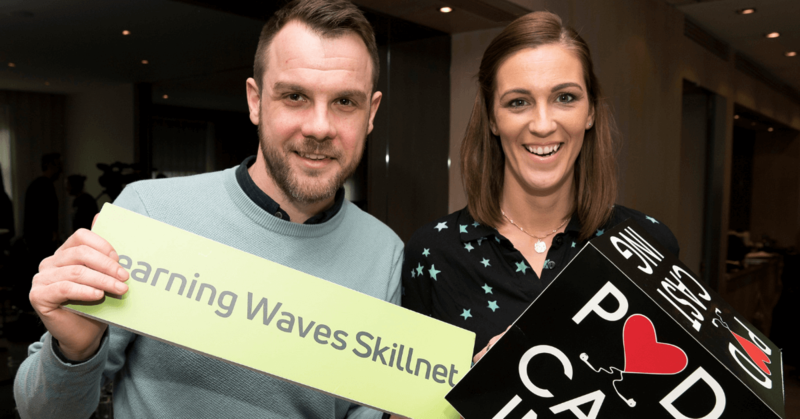 From Left to Right: Mike Hogan, Producer of Classic Hits Breakfast Programme and broadcaster and co-host of Dubland the podcast Suzanne Kane at the recent Learning Waves Skillnet Podcast Masterclass. Podcasting, in its many forms, has become serious business. It is now one of the fastest growing and most effective methods to communicate a story and it is showing no signs of slowing down. Advocates believe it should be part of an integrated marketing strategy for businesses of all sizes. Whether a podcast takes the form of sharing business insights on your own show or advertising on an established show, it’s a great way to connect intimately with your target audience. Learning Waves Skillnet recently held a Podcasting Masterclass for members of the commercial radio sector. At the event, their members were treated to an informative and entertaining masterclass from prominent podcasters, broadcast professionals and communications experts. 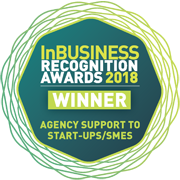 The presenters spoke about the future of podcasting, the benefits for the Irish radio sector and what marketing and advertising opportunities its increased popularity presents. 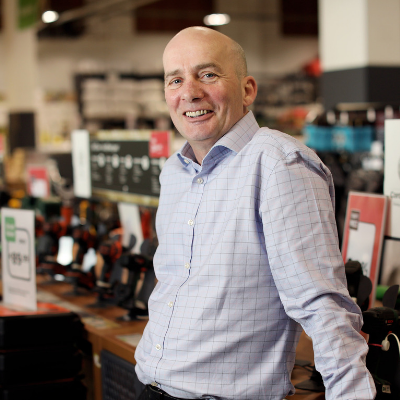 To find out how the power of podcasting can help Irish business owners, we asked the expert presenters from the masterclass to share their tips and insights with us. From their vast knowledge, we have compiled 4 key takeaways below to help you decide if podcasting will suit your communications plans in 2019. As the podcast boom is at such an early stage in Ireland the market is not yet oversaturated with sponsorship or advertising. In fact, many podcasters are looking for the right partner to sponsor them, so their listenership can grow. Additionally, the content of a podcast can be transcribed quickly and inexpensively through speech-to-text software and used to create further content such as blog articles, eBooks etc. That is several forms of content for the price of one. This can be very useful when you are your own marketing team and need to work as smart as possible. Squarespace is one of the most well-known international sponsors of podcasts. They chose to invest massively in podcast advertising and they appear on hundreds of podcasts across the world. It helps that their product is entirely online and allows the podcast host to speak authentically about a service they have used. Some sponsorship examples of Irish podcasts that Conor highlights are The Stand with Eamon Dunphy, sponsored by Tesco Finest which is a relatively rare example of a big company sponsoring an Irish podcast. Jarlath Regan’s Irishman Abroad is sponsored by Currency Fair, which works well given its listenership of Irish people living both in Ireland and abroad. As Conor states; “Podcast sponsorship is still very much in its early days. In Ireland, there is an excellent opportunity for businesses to advertise on shows which may have a small, but extremely niche listenership.” Getting in touch directly with podcast hosts and researching what podcasts align well with your brand is the best way to get started. Cost wise, Conor explains that the standard practice is for podcasters to sell advertising on a cost per thousand listeners (CPM) basis. The more focused the audience, the greater the opportunity is to build authority on a particular topic and the stronger the relationship you can create with the audience. There are plenty of opportunities for businesses to sponsor podcasts that have a dedicated, niche audience or to even create a podcast themselves in an as-of-yet untapped topic. So, is podcasting right for your business? We’ve listed 4 key reasons above as to why podcasting is a valuable communications tool, but it is hard work and might not be for every type of business. The benefits of podcast sponsorship can be hard to quantify and it’s more about strengthening your brand as opposed to direct financial benefit. The Architects of Business on JOE.ie – Series of interviews with Irelands leading (and early stage) entrepreneurs. Masters of Scale with Reid Hoffman – Reid Hoffman is co-founder of LinkedIn and Paypal and gives us access to some of the world’s top business people. 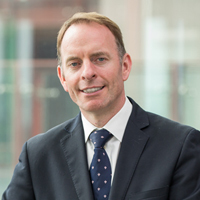 Inside Business (Irish Times) – Ciarán Hancock presents a weekly programme dedicated to Irish business and economics. Start Up by Gimlet Media – Fascinating podcast charting the journey of NPR radio producer Alex Gibney as he leaves his fulltime job to set up a podcasting production company. Learning Waves Skillnet is co-funded by Skillnet Ireland and member companies. Skillnet Ireland is funded from the National Training Fund through the Department of Education and Skills.